Scientists at the European Organization for Nuclear Research (CERN), the world’s largest particle physics laboratory established in 1954, are considering the possibility of building a new particle accelerator four times larger than the current Large Hadron Collider (LHC). CERN officials say the FCC would be 100 kilometers (62 miles) in circumference, which is much larger than the 27 kilometers (17 miles) of the LHC. It would sit next to the LHC under the Swiss-French border near Geneva. The FCC is purported to enable much more powerful particle collisions compared to what the current LHC can achieve, reaching up to 100 trillion electron volts (TeV) in energy, or seven times more than the current 14 TeV potential of the LHC. The proposed FCC project, which is yet to be approved, is the culmination of a large international collaboration involving 1,300 contributors from 150 universities, research institutes, and industrial partners. Officials hope for a decision by CERN’s 22 member states within the next few years. As CERN does not generate its own power and is run off the French electrical grid, it remains unclear how the huge energy requirements of the FCC will be met given France’s predicted shortfall in energy generation by 2025, when more than half of its nuclear power plants approach their end of life with plans to replace the plants with renewable sources of energy generation. Phil Marshall, an astrophysicist at the University of Oxford, said that the LHC already has a frightening energy demand. According to a 2011 article in Physics World, the LHC’s €10 million ($11.36 million) annual energy bill was as big as that of all households in the region around Geneva. In 2015, CERN’s website said that following upgrades, the LHC would require 20 percent more electricity to run. The Higgs boson is the particle associated with a quantum field thought to be responsible for giving fundamental particles their masses. The FCC consists of two phases. The first phase of the project would debut with an electron-positron collider at an estimated cost of 9 billion euros ($10.23 billion). In reference to the first phase, CERN said the FCC would be able to create Higgs bosons that would give scientists the opportunity to measure them like never before in great detail. “A 90-to-365 GeV (billion electron volts) electron-positron machine with high luminosity could be a first step … Such a collider would be a very powerful ‘Higgs factory,’ making it possible to detect new, rare processes and measure the known particles with precisions never achieved before,” CERN said on its website. “These precise measurements would provide great sensitivity to possible tiny deviations from the Standard Model expectations, which would be a sign of new physics.” The Standard Model is the current theoretical model of the behavior of subatomic matter. A second phase would involve a more powerful proton-proton collider, at a cost of about 15 billion euros ($17.05 billion). That machine, capable of reaching up to 100 TeV, could start operation in the late 2050s. 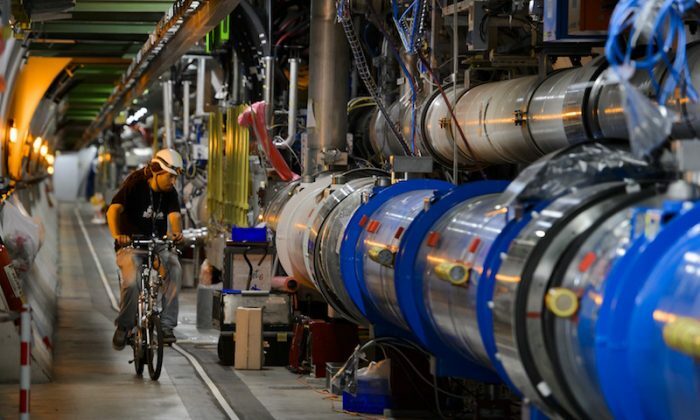 The proposed second phase high-energy proton-proton collider could provide scientists not only with opportunities to examine Higgs particles more precisely but also potentially the creation of new particles from such high energy collisions, according to CERN. “Reaching energies of 100 TeV and beyond would allow precise studies of how a Higgs particle interacts with another Higgs particle, and thorough exploration of the role of the electroweak-symmetry breaking in the history of our universe,” CERN added. CERN said it was not possible to say exactly what tangible benefits the new collider would bring to the world but pointed out that the discovery of the electron in 1897 led to the electronics industry that now contributes $3 trillion annually to the world economy. Epoch Times’ Melanie Sun, and The Associated Press contributed to this report. The physicists who discovered the Higgs boson particle, also known as the "God particle," have been awarded the 2013 Nobel Prize in physics. In 1964, Belgian physicist François Englert proposed a solution to one of the universe’s central mysteries: how a particle gains mass. The European Organization for Nuclear Research (CERN) has shown a particle with a mass which matches that of the hypothesized Higgs boson or so-called god particle.